We’ve all played it, that wonderful game that pits player against player with warring strategy and tempts us all to throw the board. The game, is Battleship. The goal of Battleship is to hit the opponent’s ships with pegs or ‘missiles’ until you win. Each player is given the opportunity to configure their battle plan however they choose placing their ships around the board. A little unknown fact is that this game was once known as the ‘pencil and paper game’ because it started out as a game that was played with note pads. Dating back to World War I, the concept of Battleship originated when war games were popular. Beginning as a ‘pencil and pad’ game, it was published in this form by several companies and in the 1960’s was released as a plastic board game by the toy and gaming giant, Milton Bradley. The game was thought to have originated in France and has changed and evolved ever since. Battleship is played with two players who each have their own fleet of ships. Each player places their fleet on a grid (squares) that are identified by a number and a letter for coordinates. There are five ships that are placed on the grid and include: the carrier, which is five grid spaces; the battleship that is four; the cruiser that is three; the submarine that is 3; and the destroyer that is two. Once the players place their ships on the grid each takes turns shooting missiles to sink each other’s fleets. If a ship is hit, you put a peg in it to show that it has been hit. The game goes on until one player sinks all the ships of the other player. This summer Amusement Masters will have GIANT BATTLESHIP available in our event entertainment inventory. A super fun game – one that we have all played and that is great if you’re looking for a bit of strategy mixed with a bit of luck. This classic is now larger than life, and is perfect for an indoor or outdoor event where you’re looking to add giant synergy, hours of excitement and lasting memories. 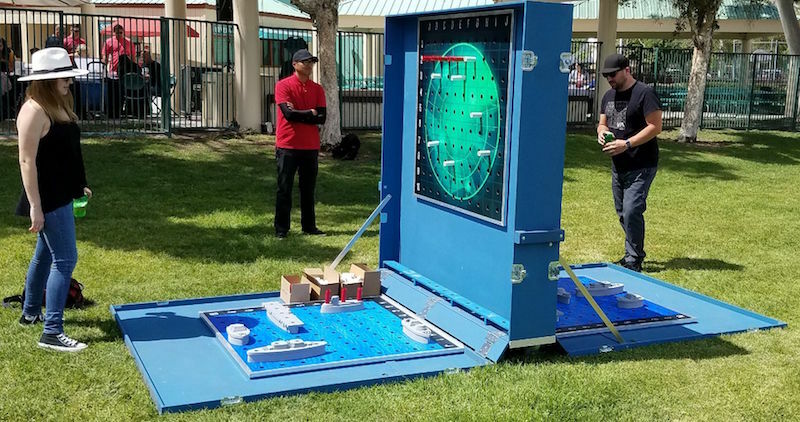 Click HERE to connect with our team and find out how to bring Giant Battleship to your next event! Our DC Digital Photobooths Share Your Event Across Social Media! Pump Up The Tunes With Our New Jukebox For Events!